Dead Dapchi Girls' Parents: "Government Betrayed Us"
Adamu Jumbam, father of Aisha Adamu, one of the Dapchi schoolgirls who lost her life while in Boko Haram captivity, has said he is not happy with the Nigerian government and its security forces whom he blamed for the tragedy that befell his daughter. While speaking with PT, Mr. Jumban currently in Dapchi village where he is mourning his 16-year-old daughter questioned the circumstances that surrounded the abduction and subsequent release of the girls by Boko Haram. Speaking amidst a large crowd of mourners and sympathisers that throng his family home in Jumbam, the bereaved father said he has lost faith in the Nigerian government. 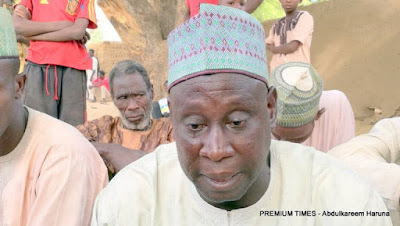 “It was my worst moment in life when I was told she died,” Mr. Adamu said. “It has been a huge bereavement that befell me on Wednesday when these poor schoolgirls were returned and I rushed out to welcome them only to be told that my daughter was among those that lost their lives. “I was told that they died on the way, and the Boko Haram simply dug the ground and buried them. This confirms that I have lost her, so we the family have nothing more to do for her than to mourn her. Mr. Jumbam said despite his bereavement, many of them in Dapchi could not understand the “mystery of the abduction and the drama of the girls’ release on Wednesday”. “We have no option than to still commend the government for seeing that most of the children that were taken from us have been brought back”, he said. “But what bemused us most is that, it is very shocking and surprising to say that Boko Haram came into this community, picked our children without any one challenging them, and then brought them back on their own, dropped them in the town and then returned. That development has really unsettled most of us here in Dapchi. “Every right thinking Nigerian should be disturbed by this development. Anyway, we are villagers and may not have insight to the undercurrent of what has been going on in this country. But to say the least, we have been cheated and dehumanised. “How can one come to terms with this, for God sake? That Boko Haram came into our community, took our children and kept them for a whole month, no one could say where they are, then returned them without any form of explanation. “They brought this kids to Dapchi dropped them in market area, spent about 30 minute in the community, then turned their vehicles and left. None of our security agencies that have been surrounding this community since February 19th made any move to go after them. He says the government is not sincere in its approach. “We don’t know what was happening. But it seemed this government is only deceiving us or playing politics with the lives of our children. If they say Nigeria is no longer safe for us, that our security forces cannot protect us, then perhaps they should allow us to go to somewhere where the government cares about the security of its people. “Can anything be more surprising than this? How can you beat a situation where a thief came to steal your property, harm members of your household, then few days later, the same thief came with the stolen item, dropped it for you and left, while everyone was watching and almost applauding him. “These Boko Haram gunmen came back in broad day, confidently as though they were the ones in authority. What else could be more surprising than this? It is a clear sign that this country is gradually becoming a failed state where security is not guaranteed; where the government has to bury its shame and tell everyone to take his or her security into their own hands, because they can no longer protect us. “My daughter, Aisha Adamu, was 16 years old, a bright little girl that wants (wanted) to be a scientist in the future. She was in her fifth year in secondary school. It was her friends who came back that informed about her death. When I asked after her, they said ‘oh baba (father), your daughter Maidanwake (her pet name at home) lost her life on the way to the bush’ (sobs…). She was fasting when she died,” he said. Of the 110 schoolgirls kidnapped in Dapchi in February, 104 were released by the Boko Haram, five died during the kidnap while one remains with the terrorists for allegedly refusing to put on a hijab and renounce her Christian faith.